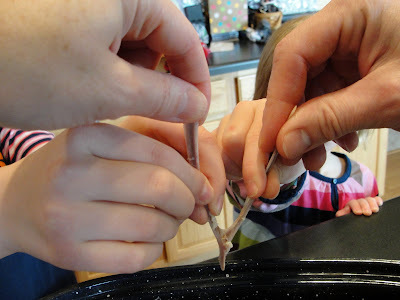 This is our wishbone from the turkey. As we all made our special wishes...Little Chick piped in and said she wished Grandpa was alive...SOB! What do you say to that?? Oh the innocence of babes. After dinner we decided we HAD to take a walk. It was pretty cold, so we really bundled up. I'm a fast walker. It's just in my genes I guess to out walk everyone by at least 10 paces. I have to really make a concentrated effort to walk with people. Didn't know that about me did ya?? I took my camera...couldn't pass up taking pics of nature. Another beautiful sunset... thank you Lord. After the walk I took a coma nap...you know the kind of exhausted, stuffed belly nap where you could sleep and lose all track of time. That was me. Honey was watching football of course:) Afterwards we kept our word to the Chicks and put up the tree. It was a challenge, because neither of us had an ounce of energy. 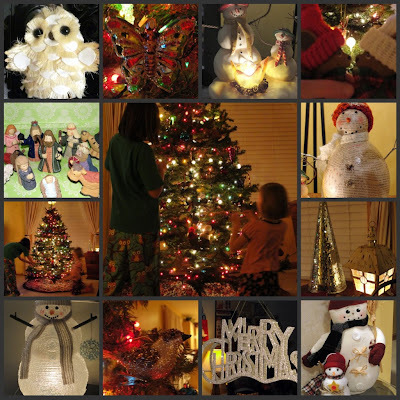 Good thing the girls had enough for all of us:) These are just a few of my favorite Christmas things. I think I have a little thing for snowmen:) So how was your day? Did you eat too much? I know I did!! !